All good things must come to an end, and that includes tenancies. In general, the law which covers tenancies is governed by two statutory codes, which are the Housing Act 1988 (which applies to all assured and assured shorthold tenancies) and the Rent Act 1977 (which applies to protected tenancies.) Common law tenancies are slightly different and more unusual. With tenancies governed by the Housing Act and Rent Act, the tenancy can carry on until the end of any fixed period that is written into the agreement on what’s called a ‘periodic basis’, and the same terms and conditions will apply to the tenancy in the next period as in the fixed term. The period over which a tenancy is renewed depends on how often the tenant pays you rent, so if rent is paid monthly, the tenancy will run from month to month and be called a monthly periodic tenancy. Any tenant who stays in the property after the end of the fixed term of the tenancy agreement is not legally a squatter, but remains a tenant and has a valid tenancy agreement. As a landlord, if you want a tenant to leave your property, you need to serve the appropriate notice – and the type and period of notice will depend on the type of tenancy agreement. In general, a residential tenancy that was entered into after 28 February 1997 will be an assured shorthold tenancy. To end an assured shorthold tenancy, you would need to serve a Section 21 Notice under the Housing Act 1988. This is based on a landlord’s right to recover his property without having to give a reason, after the fixed term period set out in the tenancy agreement. You must give your tenants at least two months notice that you want them to leave the property. If you serve a Section 21 Notice after the fixed term has come to an end, it must expire ‘after a date specified in the notice, being the last day of a period of the tenancy’ – which means that in practical terms you’ll end up having to give the tenant two to three months notice - depending on the time of the month you actually serve the notice. If your tenant wants to leave your property at the end of their fixed term period, there is nothing to stop them doing so without giving you any notice whatsoever. You must not write any terms into the agreement that ask for notice in these circumstances either, as this could make the whole tenancy agreement invalid. If they stay in the property for just a single day after the end of the fixed period, the tenant has to give you at least one month’s notice if they intend to leave. A tenant can’t give notice that they want to end their tenancy while the tenancy is in the fixed term period, unless there is a clause written into the agreement called a break clause. If this clause allows the tenant to leave once two months notice has been served on the other party in writing, they can then be able to leave without penalty, so long as they have followed the rules. The break clause can also be used to a landlord’s favour. 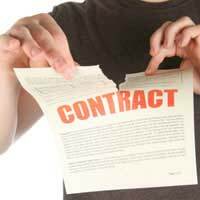 If there isn’t a break clause in the tenancy agreement, the tenant will not be able to end it before the fixed term comes to an end. If you have a problem tenant, and they won’t leave your property voluntarily, all you can do is take the matter up through the courts and try to legally recover possession of the property. If you get a court order for possession, and then have to follow this up with the threat of bailiffs (or indeed have to send them round to change the locks) you can’t be accused of unlawful eviction or harassment. A court order for possession will usually end the tenancy agreement – unless it’s a suspended order which is usually suspended on condition that the tenant pays rent arrears on top of their usual rent until all arrears are cleared. If you get a suspended possession order against a tenant, you won’t be able to use that order to evict them if they cause further problems, and if the tenant gets into arrears again you will have to start fresh court proceedings. This is a long one, so bear with me! Tenant signed 12 month AST 1st June 15. We did inspection sep 15, the house is an absolute bomb site! Mould on bathroom and kitchen ceiling is horrendous, ripped wallpaper, torn carpets etc. Tenant hadnt informed us of this prior to inspection. This is down to lack of ventilation(windows never opened, air vents blocked by piles of.well take your pick, tumble dryer being used) we actually lived in the house prior to renting it out and we never had an issue with mould.Anyway, as I felt it was an immediate health and safety issue due to her having young children in the house and knowing she wouldn't be in a hurry to sort the problem. I told her I'd sort it out. I went back three days later on my day off, stripped the ceiling, treated the mould and painted with anti mould paint. Whilst cleaning the bathroom I noticed behind the toilet was soaking, when I asked the tenant how long this had been a problem, her reply was not long after we moved in, when asked why she hadn't informed me, she said her dad told her it was condensation. Now I'm no plumber, but it was clear it was a leak from the flexi hose, which I fixed straight away. However the grout and tiles have cracked and the toilet is sunk into the floor. I have arranged a builder to come and assess the damage that has been done, confirmed times, only to turn up and tenant not being in! My first question is can I enter the property whilst tenant isn't in if they were aware and had confirm visit? Second question, can I serve a section 21 notice to get them out before the 12 months are up, due to several breaches to the agreement? 3rd question- today I have found out she is running a photograph business from the house. Half hour appts from 9am-7pm. (Not permitted to use property for business use, which is stated in tenancy agreement. Who do I report her to, as I have told her she isn't allowed to do this and she has not listened to me, as she is continuing to do it? Apart from the information in the article, you can find out more via the Shelter link herewhich should answer your questions regarding access and eviction. This is a long one, so bear with me! Tenant signed 12 month AST 1st June 15. We did inspection sep 15, the house is an absolute bomb site! Mould on bathroom and kitchen ceiling is horrendous, ripped wallpaper, torn carpets etc. Tenant hadnt informed us of this prior to inspection. This is down to lack of ventilation(windows never opened, air vents blocked by piles of....well take your pick, tumble dryer being used) we actually lived in the house prior to renting it out and we never had an issue with mould. Anyway, as I felt it was an immediate health and safety issue due to her having young children in the house and knowing she wouldn't be in a hurry to sort the problem. I told her I'd sort it out. I went back three days later on my day off, stripped the ceiling, treated the mould and painted with anti mould paint. Whilst cleaning the bathroom I noticed behind the toilet was soaking, when I asked the tenant how long this had been a problem, her reply was not long after we moved in, when asked why she hadn't informed me, she said her dad told her it was condensation. Now I'm no plumber, but it was clear it was a leak from the flexi hose, which I fixed straight away. However the grout and tiles have cracked and the toilet is sunk into the floor. I have arranged a builder to come and assess the damage that has been done, confirmed times, only to turn up and tenant not being in! My first question is can I enter the property whilst tenant isn't in if they were aware and had confirm visit? Second question, can I serve a section 21 notice to get them out before the 12 months are up, due to several breaches to the agreement? 3rd question- today I have found out she is running a photograph business from the house. Half hour appts from 9am-7pm. (Not permitted to use property for business use, which is stated in tenancy agreement. Who do I report her to, as I have told her she isn't allowed to do this and she has not listened to me, as she is continuing to do it?